From the sheet of puff pastry for Quiche cut some strips of dough as long as the diameter of the Pan and a round of top diameter of at least 6 cm compared to the diameter of the Pan you will use. Wash the leeks and cut them into slices. In a skillet, sauté the onion and margarine fairies. Add a tablespoon of water and a teaspoon or two of curry powder and stir well. Put the leeks into rings, 1 teaspoon vegetable stock cube, two tablespoons of water. Cook over low heat for not lightly sauté the leeks. Turn off the heat when the leeks are soft but dry. Add the soy cream. Stir well. Pour the mixture of leeks on the pastry, deposited the strips on the surface, creating a diamond pattern, pull the edges between your fingers to curl it and bake. Ci sono troppi porri. Risulta troppo pesante anche se buona. Risposta per aapti: in commercio ci sono anche paste sfoglie 100% vegetali (non possiamo scrivere quali per non fare pubblicità). 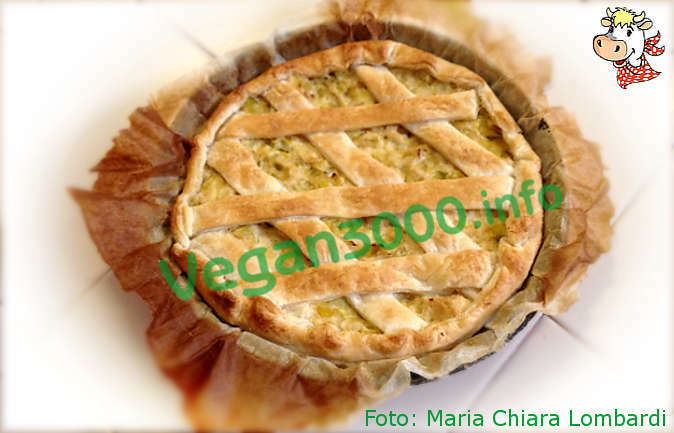 In particolare quelle biologiche sono 100% vegan. Perche' usare una pasta sfoglia che e' grassa quando si puo' fare quella con acqua olio e farina di kamut? Anonimo, noi usiamo sempre tutto il porro, sia la parte bianca sia la verde.